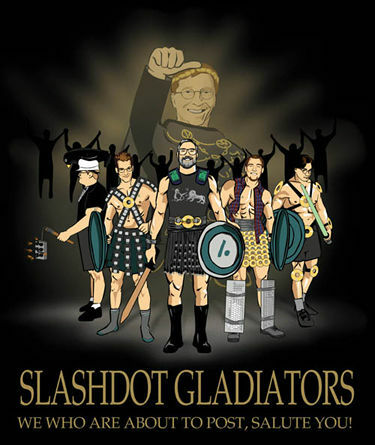 As seen on After Y2K, Nitrozac's beautiful illustration of the Slashdot Gladiators now appears on a t-shirt! Your Slashdot heroes have never looked so good, as they prepare to do heroic battle against an Evil Empire! That's it! We're sold out, the Slashdot Gladiators t-shirt is history! Be sure to check out these other great shirts!